Laundry - my arch nemesis. The most daunting chose for most of us. Sure, we love wean clean clothes that don't smell like last months dirty socks but it’s an important task if we want to look and smell our best. Since having children, my entire laundry routine has changed. I’ve learn to get even the most stubborn stains out. I’ve also learned that pre-socking is often necessary and at times a life saver or I should say a clothes and money saver. I’ve avoided having to throw out many new and still useful outfits. And I most importantly learned that small humans can create some foul odors on their clothing. Running around and playing outdoors not only soils their clothes but also attracts not so pleasant smells. I’ve been a big fan of Gain long before my children were born. I love the fresh clean smell it provides and it works very well to get my laundry clean and smelling fresh. Gain has added another amazing scent to their line of laundry products. Gain Fresh Water Sparkle™ scented products are exclusive to Dollar General and the two new Fresh Water Sparkle™ scented items are now a part of my ‘smelling fresh’ laundry routine. Click on the coupon badge above for extra savings. On my recent trip to Dollar General I grabbed the entire Fresh Water Sparkle product line. The smell is amazing and I wouldn't expect anything different from Gain. New Gain flings!™ laundry pods are incredibly simple to use. The Gain fireworks!™ in-wash scent booster beads are a must have for me, they help combat odors and get our clothes and home smelling clean. Gain fabric softener also helps provide a fresh and lasting smell and keeps my laundry soft. 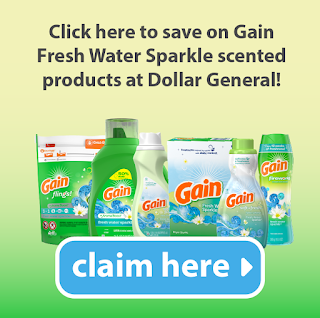 Stop by your local Dollar General and pick up a few Gain Fresh Water Sparkle™ items to get your family and home smelling and looking fresh and clean.